I’m not against religious movies. I’m not. I’m for anything that has a good story. But one of the categories of mediocre stories, for me, is the one where thesis is substituted for theme. You know what a thesis is. It’s that thing English teachers talk about day and night: the controlling idea of an essay, the idea to which everything in your essay points. Theme is more subtle; it’s an idea, yes, but one that permeates the story, like morning light revealing the details of a landscape. October Baby has a thesis, not a theme. And so its effect is more essay-like than story-like. I’ll focus on one scene to illustrate my point. Hannah, the central character, is a nineteen-year-old woman who’s been feeling dizzy, sick, and moody. Her parents take her to a doctor, but even he is stymied about the cause, until her parents reveal, in a rush right there in the doctor’s office, that not only was Hannah adopted, she was also born after a failed abortion. If you’re a story cop, now’s the time you’ll want to pop the whirling red light on top of your squad car. 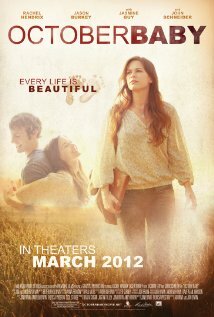 Would any parents, but especially the hyper-religious parents in the movie, be so off-hand and blunt in revealing the circumstances of their adopted daughter’s birth? OK, no, I’m not quoting directly from the movie, but the bluntness is all there. Real human beings—especially loving—don’t act this way. Someone might hasten to point out that the movie was inspired by a real person’s efforts to come to terms with similar circumstances. Or that real people say and do the craziest things sometimes. But reality is never an excuse for bad character development. Why are the parents so blunt in the scene and nowhere else in the movie? Because the movie-makers needed to nail down that thesis by any means necessary and at whatever cost to credulity. In case you’re wondering, this isn’t the only eye-rolling moment in the movie. Unbelievable coincidences abound. And the dialogue is so over-loaded with exposition that characters sometimes seem like a string of exposition mules. Didn’t I like anything? I thought the performances were mostly solid. First-timer Rachel Hendrix does a good job with a tough role. And Jasmine Guy has an affecting scene that makes us forget, though only for a moment, the ham-handed story construction. And several of the actors bring believability to their roles. And anyway, the makers of October Baby have nothing to fear from my little rant. Their production costs came in at around a million. And so far, the movie has made over three-and-a-half million. They’ve got a minor hit on their hands. The movie’s success, and the growing popularity of Christian-themed movies, may be an indication that movie-makers have reached out to a segment of the audience that has been ignored for too long. I’m all for a greater variety of movies. I mean, is anyone else, like me, worried that the spate of superhero movies might trigger a world-wide Lycra shortage? But seriously, how about a little more subtlety and a keener eye for story and character development? 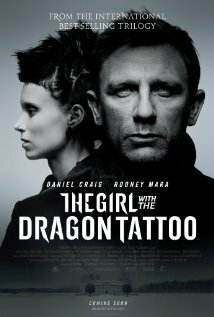 It’s true I haven’t reviewed The Girl with the Dragon Tattoo and here it is out in DVD and Blu-ray already, but that’s because I didn’t really see the point. A perfectly good film version of Stieg Larsson’s international bestseller had already been produced, a moody Scandinavian scald-fest that honors the novel without replicating all of its tiresome exposition about politics and magazine publishing. I like the trilogy despite its problems with exposition and the fact that the writer (or the translator) seems to write with his knuckles. Still, strong story and a fascinating central character and a powerful sense of scene. More than enough reason to brave the arid parts. Along comes David Fincher with an American version of the Swedish film that feels too often like a shot-for-shot emulation of the original. Even the lighting seems exactly the same. Fincher says he had never even seen the original before shooting his film, but look at the parade scene in both movies. Even the camera angles are the same. And why re-film it at all? The only reason to remake it is American audiences are too lazy or too near-sighted to read subtitles. And it’s such a shame. Fincher’s movie is fine. Daniel Craig was the right choice to play Mikael Blomkvist. And though I had doubts about whether Rooney Mara would make a good Lisbeth Salander, she does a fine job (though Noomi Rapace is still the quintessential Lisbeth). The problem is the movie just wasn’t unnecessary. There’s a long history of Hollywood making unnecessary remakes of perfectly good (and sometimes great) European films. The most striking example before Dragon Tattoo was Let Me In, the tamer and more domesticated version of the strange and compelling Let the Right One In. But hey, I’ll never get my lawn fertilized if I go through the whole list of Hollywood remakes. Most of them end up as sanitized versions of the original (compare The Vanishing to The Vanishing). The magical thing that happens when you watch a great movie that happens to be subtitled —or even just a pretty good one—is that you forget you’re reading. So next time a subtitled movie comes to town, America, don’t forget to bring your glasses . . . no, not the 3D glasses, your reading glasses . . . right there on your bedside table, next to that novel you’re reading. What? You’re not reading a novel? In fact, you don’t read books at all? How said for you. If you ever wondered how British actors pay their mortgages, they do it by playing mostly bad guys in what used to be called “sword-and-sandal” movies, stories vaguely set in the ancient world with a mish-mash of cultural references. Truck everyone out into the desert, dress your actors in bed sheets and throw rugs, and you’ve got Hercules, Hercules Unchained, War of the Trojans, etc. But that was so long ago, right? In the 50’s? Nothing like that around anymore. Now we are too sophisticated for that nonsense. Right? Actually, this kind of nonsense is all over the place, except we might want to call the new versions “sword-sandal-and-cgi” movies. 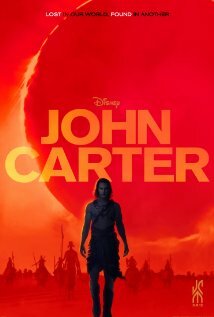 Hence John Carter and a cartload of others lookalikes that blend sci-fi, fantasy, and desert epic. Taylor Kitsch plays Carter, a Confederate soldier who finds himself on Barsoom (Mars, to you and me) after fondling a medallion. (A word of advice to movie heroes: you’d have fewer problems if you’d just avoid all medallions. Just say no to shiny things!) Kitsch, a graduate of the James Franco school of acting, plays Carter as a mumbling introvert. But what made Kitsch a standout on TV’s Friday Night Lights doesn’t work so well in a sci-fi desert epic. Of course, I guess any one of us would be a brooder if we found ourselves suddenly transported to another planet in the middle of a civil war. Carter first discovers that Martian gravity makes him able to leap tall buildings at a single bound. There’s a funny scene where he gets used to his new-found power. But I have to say that even in the battle scenes, the sight of the character catapulting through the sky is a wee bit comic—a wildly exaggerated version of the leaping attack of Brad Pitt’s Achilles in Troy. Carter is caught by the Tharks, a barbarian race of warriors who don’t seem to care that the Zodangans, led by evil Sab Thança scenery-chewing Dominic West, are intent on wiping out the city of Helium. But Sab is no more than a puppet for the Therns, who, like all good bullies, perpetuate evil just because they can. There are two standout actors in the movie. The first is Lynn Collins, who plays the princess-in-jeopardy as a battle-hardened warrior who makes John Carter look like a cappuccino-swilling emo-boy. The second is James Purefoy, who has a small part but who plays it with such wicked glee amidst all the solemn bombast that you wish there were more of him. Many other fine actors fill out the cast, notably Willem Dafoe, Bryan Cranston, Ciaran Hinds, Mark Strong, Thomas Haden Church, and Samantha Morton. But they’re wasted on this movie, which is derivative right down to the last 1’s and 0’s of its CGI coding. It may be true that there is no new thing under the sun, but this movie robs too freely from Star Wars, Star Trek, and Avatar, with a dash of Stargate and a soupçon of The Iliad tossed in for good measure. In other words, it’s now official: Hollywood no longer makes movies; it makes mash-ups.